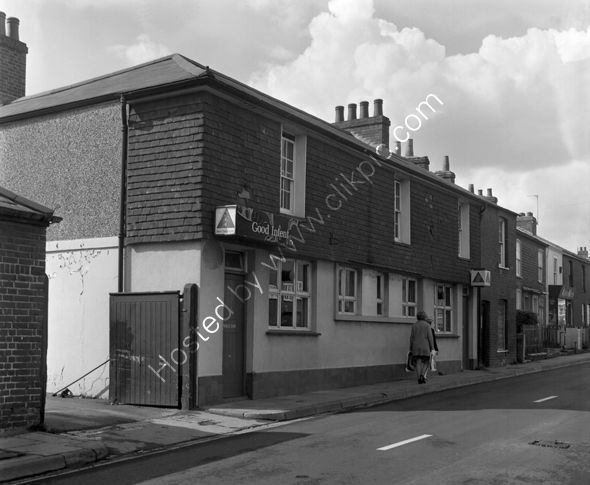 Good Intent, Trinity Street, Fareham in 1973. At that time a Bass Tavern this was later owned by Admiral Taverns and closed. It reopened in 2018 it is reported to be doing well in 2019. In this photo the tile hanging is damaged, broken and in some parts missing. The premises two doors down is "Audio Match". For commercial use of this photograph please visit www.alamy.com and search for RFFCBG but for a one off print, please see below.